Having just recently watched Stanley Kubrick’s 1980 film, The Shining, starring Jack Nicholson and Shelley Duvall, I was inspired to think through the entire genre of “horror,” how it works, and what it does for us. Despite the fact that most of us would characterize fear–and most certainly its extreme, “horror”–as a negative emotion, why do we seem to seek it out for enjoyment? Why, especially as we approach Halloween, do we look FORWARD to and plan parties around being afraid? Clearly, there is some degree of delight we get from fear–probably the rush of adrenaline that studies show is addictive. There’s also something to be said for being afraid knowing that the danger evoking that fear is safely confined to the television screen and that your physical and psychological well-being is actually perfectly safe within the larger perspective. Regardless, we enjoy experiencing the adrenaline high from being horrified–as long as we know we’re safe–and therefore, the creative genii responsible for creating those horrifically terrifying films and experiences are actually serving us, giving us that horrification that we so desire. These genii are professionals with skills and techniques that the rest of us don’t have. I’d like to take a look at some of these techniques that I’ve begun to notice. Perhaps we can come close to answering the question: How is it possible to utterly terrify us when we, in fact, know, at some rational level, that we are perfectly safe? 1. You have to start with the banal. Your central characters should be people that the audience will perceive as “normal.” Just like us. People we can respect and relate to. Not only do they have to be “normal” people similar to ourselves, but they are always in situations in which we regularly find ourselves or in which we could easily imagine ourselves. To further complicate the issue, we don’t need characters to be perfect in order for us to relate to them, we want them to have flaws, slight flaws, that remind us of our imperfect selves. They are, like all of us, people who are “normal” yet somehow find themselves transgressing against some kind of social expectation, yet in a way that we can understand and forgive. For example, Janet Leigh’s character in Psycho is a respectable, working woman who appears to be completely on the up-and-up. However, we find out her character flaws: she is having an affair with a man and is planning on embezzling money from her work to run away with him. The audience can relate to her because she seems like a good person who is doing something a little foolish for love. And who hasn’t been there? We almost find ourselves rooting for her in her scheme, but the fact that this good girl is breaking the rules is enough to foreshadow in our minds the horror she has coming. She finds herself shacking up for the night in a desolate, creepy, locally-owned motel. Again, this is a situation all of us have been in. Consistent with the role of the banal, the everyday, in horror, we all have stayed in motels, which is what makes using one as a setting for a horror flick all the more familiar and disconcerting to us. In Friday the 13th, the teenage camp counselors are our central characters. They are rendered to us as normal, typical teenagers. Their transgressions are ordinary and forgivable (drinking, developing teen romances), which makes the resulting horror even more disturbing to the viewer. The setting is a classic summer camp on a lake, lending a sense of youth, innocence, and typical American teen life to the film, allowing us to imagine ourselves as those characters who end up terrorized by evil. This trend is also evident in Halloween, which was released just a couple years before Friday and where the lead, Jamie Lee Curtis (coincidentally, the real-life daughter of the aforementioned Janet Leigh) is your typical, innocent teenage girl who does well in school and earns extra cash as a reliable and fun babysitter. However, it’s when she begins to be ever-so-slightly irresponsible with regard to her babysitting duties that she almost becomes the victim of an insane, masked villain who wants to hack up teenagers! So you see, every horror narrative is centered around people whom we find to be just like us and in situations in which we often find ourselves. We get scared because the filmmakers know how to coax us into seeing ourselves as the central characters–whom you will notice are always the victims! 2. The “evil” that is the source of all terror is always an embodiment of society’s anxieties at that time. Regardless of our individual fears, it is what society as a whole, what ALL of us worry about, that ends up creeping into our horror fiction. You can often tie horror narratives to historical and cultural events that are going on at the moment from which the narrative emerged. For example, an early version of the horror narrative–the fairy tale–emerged in the Middle Ages. Who is always the source of the horror? The witch! The idea of a strong woman living on the edge of society with magical powers was terrifying to medieval society. Now that witches are less of a concern to us, we’ve decided that those fairy tales are mild enough to share with our children. Let’s consider Psycho. Psycho represents a time in the late 50’s, early 60’s when society was really wrestling with how to view mental illness, especially those dealing with duality and fragmentation of the human psyche. Norman Bates seems like a nice guy, but he “is” also his elderly and abusive mother. He is a man but he “is” also his mother. At a time when schizophrenia was just beginning to be discussed in common culture, its defining characteristic of a shattered psyche was enough to evoke terror in ordinary people. This tradition of mental disease and fragmented personalities being something of which to be terrified is carried on in Friday the 13th, including the Freudian mother/son and gender identity issues. Halloween and The Shining also deal with the notion of violent mental illness stemming from violent trauma. In essence, if an innocent person experiences something horrific, their psyche is disturbed enough to render them also horrific. 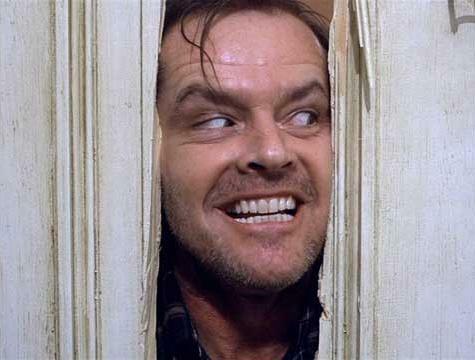 Jack Nicholson in The Shining. Mental illness is one of the social anxieties the film uses. 3. My last point is that while we are envisioning ourselves as the central characters in these films being terrorized by whatever monster society fears most at that moment, we are even more deeply disturbed when the most horrific moments occur when those central characters are engaged in something we consider especially vulnerable. How many people hesitated to take showers after watching Psycho? Standing in the shower, naked, unable to hear what’s going on outside the shower, with your eyes closed while you shampoo your hair is probably one of the most vulnerable positions a human being can be in. Hitchcock knew this and used it. In Friday the 13th, Halloween, and that classic of all horror stories: the legendary “hook on the car door” story, the central characters are teenagers being “naughty” in a place where they shouldn’t be. Again, an everyday anxiety creeps up in our horrific fictions. Now you try it! Write your own horror movie!